It seems there are a lot of people who wonder, “Am I good enough to go to heaven?” They wonder if they’ve done enough good, if they’ve helped enough people, if they attended worship services enough times, and if they have taught enough people about Jesus. And then, on the other hand, there are those who wonder if they’ve been too bad to go to heaven. I want to attempt to answer some of these questions. You first need to understand, the answer to your question is a resounding, “No.” You most definitely are not good enough to go to heaven and neither am I. The only person who was ever good enough to go to heaven is Jesus. I don’t care how many songs you’ve sung, how many prayers you’ve prayed, or how many people you’ve helped, you are still not good enough to go to heaven. If you’ve committed even one sin, and we all have (Romans 3:23), then you are completely unworthy of heaven. God doesn’t grade on a curve. He doesn’t say, “Well, you were better than most, so you get in.” That’s not the way it works. If you’ve sinned in any way, shape, or form you are not good enough for heaven. That being said, Jesus came to save sinners like us. His blood is the only thing that can make us good enough for heaven. His blood washes away every sin. It doesn’t matter if you’ve sinned once or a million and one times, the blood of Jesus can wash away each and every sin. No matter how bad you’ve been, you can be saved. You don’t have to convince God to save you, He already wants to save you (1 Timothy 2:4) and He’s already paid the price for your salvation. So, no more, “I would become a Christian, but I’m afraid I’ve just been too bad for Him to save me.” Don’t doubt the efficacy of the blood of Christ. If He can save a murderous sinner like Saul of Tarsus (1 Timothy 1:15), He can most definitely save you. No one is too bad to save! At this point, some are saying, “Yes, yes, I know. But have I been a good enough Christian to deserve to go to heaven? After I was saved from my former life, have I done enough good things – have I been obedient enough – to go to heaven?” I’m sorry, but all of the good things you’ve done since becoming a Christian, do not make you any more worthy of heaven than when you were first saved. If a murderer was baptized into Christ Jesus for the forgiveness of his sins (Acts 2:38; Galatians 3:27), and died a minute after coming up out of the water, he would be just as saved as a man who had spent 50 years of his Christian life faithfully preaching the gospel. Both men will go to heaven, equally saved. We were initially saved by grace through faith, we are currently being saved by grace through faith, and we will ultimately – on the Day of Judgement – be saved by grace through faith (Ephesians 2:8-9). Jesus told his disciples, “So you also, when you have done all that you were commanded, say, ‘We are unworthy servants; we have only done what was our duty’” (Luke 17:10). Just as no one is too bad to save, no one is so good that they deserve to go to heaven. And Paul warned those in Corinth, “Let anyone who thinks that he stands take heed lest he fall” (1 Corinthians 10:12). That’s not to say, of course, that we will automatically fall from grace for committing a sin. John wrote, in 1 John 2:1, “My little children, I am writing these things to you so that you may not sin. But if anyone does sin,we have an advocate with the Father, Jesus Christ the righteous.” In order to have Christ continue to be our advocate, and continue to forgive our sins, we must “walk in the light as He is in the light” (1 John 1:7). Walking in the light includes refraining from doing evil, and also doing the good God has prepared for us to do (Ephesians 2:10). If we do not do the good we know we ought to do, it is sin (James 4:17). If we deliberately refuse to do the good we should be doing, we are no longer faithfully walking with Christ. The idea that it is impossible for a Christian to fall from grace is one of the biggest lies ever perpetrated on humanity (Galatians 5:4). If a man stops walking with Christ, he stops receiving the forgiveness Christ offers. No living person is safe from falling. We must all guard ourselves diligently against apostasy (Hebrews 3:12). The bottom line is this, whoever is in Christ – no matter what he may have done in his past or how little good he has accomplished – will be saved on the Day of Judgement (Romans 8:1). Likewise, whoever is not in Christ – whether because he has never obeyed the gospel or he has fallen away from Christ – will be lost. So the ONLY thing that matters, when it comes to your salvation, is whether or not you are in Christ Jesus. Have you been baptized into Christ for the forgiveness of your sins (Acts 2:38; 22:16; Romans 6:1-7; 1 Peter 3:21) and are you faithfully abiding in Him (John 15)? 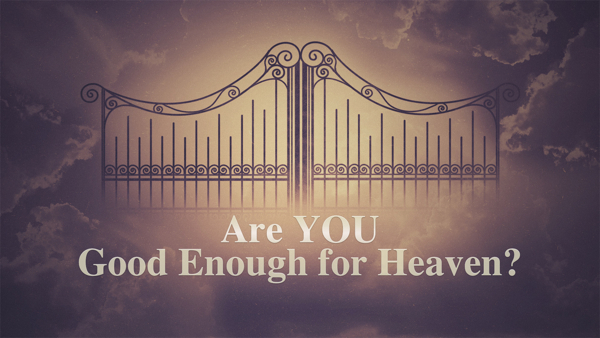 You are NOT “good enough” to go to heaven, but if you’ll stick with Jesus, He promises to get you in (John 14:1-6).